The old hormones are heading into melt down. Not just the usual monthly spitting puff adder kind of melt down, but the proper giving up the ghost, throwing in the towel melt down. The melt down we all missed in our mothers because we were all far too busy having fun as teenage tearaways to be bothered with a sobbing, swearing parent. You know the kind, when you’d come home to find the dog eating a full roast dinner with Yorkshire puds, or a plateful of pasta sliding down the kitchen wall. Or the laundry basket kicked down the stairs. Or your dad’s golf clubs strewn across the lawn. Or the bedroom door firmly shut and a take-away menu blu-tacked to the fridge door. Those moments when you just shrugged and went to watch Top of the Pops or sloped off to your room to listen to the recording you’d made of this week’s charts at full blast. and it would appear it did the same for many of my followers. 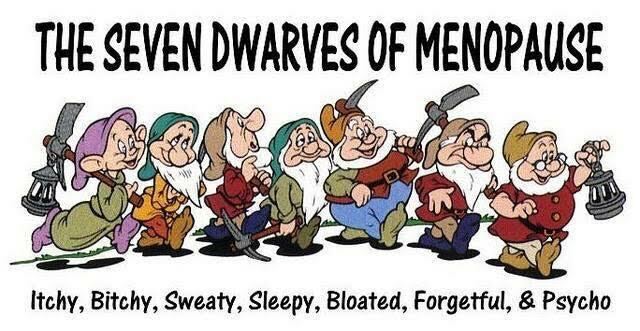 Including the one who said there should be eight dwarves, as Leaky had been missed off the list. Yes, ha ha, very droll. Thus far I have encountered a few of the boys pretty much on a daily basis. Itchy, Forgetful and Psycho pop round most days for a cuppa, but seem to leave fairly quickly. I have had a slight run in with Bitchy, but that may just be a genetic condition, it’s hard to tell. Psycho and I are old friends – he often pops by for a few days at a time. We have a rant, put the world to rights, kick a few backsides here and there and then he wanders off again. 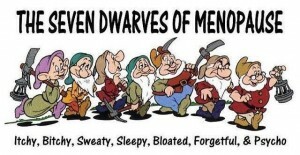 Bloated, however, seems to have pretty much moved in on a permanent basis, so I did a bit of digging and found out that I am developing something called – and I kid you not – the Menopot. Yes, you read that right, the Menopot. That neat little cushion of fat we used to call a muffin top when we were skinny young mothers with tight jeans and a bit of a baby belly has now turned into a permanently inflated air-bag. There is no way at all that it can be remotely disguised as a muffin of any kind – this is more like an entire chocolate gateaux with cream frosting. And it ain’t going anywhere. Apparently it has something to redistribution of fat storage from my legs to my tummy and …blah, blah, blah. Whatever. I didn’t order it and I don’t like it. The rest I can pretty much live with. I’m used to seeing Sweaty once in a while from all the exercise I do, so when he rocks up in the night I just roll over and go back to sleep. Sleepy and I are old friends – we spend a lot of time together each night. If he fancies coming round mid afternoon, who am I to argue? Forgetful is quite a handy friend to have too. He gets you out of all sorts of bother. I’ve always had a habit of forgetting stuff so now I have a perfectly good excuse. it’s win-win with him as far as I’m concerned. Leaky is a bit of a worry. I’m not even going to contemplate allowing him through the front door, let along making him tea and letting him get his feet under the table. So there it is, me and my little entourage seem to be getting along fairly well for now. Whether we’ll all still be friends in a few months time, who knows? I’m hoping the boys will get bored with me and move along to annoy someone else fairly soon. After all, two’s company but nine is a bit of a crowd. Oh boy! Am I with you on this. Sweaty was the killer a couple of months ago and he had to be evicted. I now take Sage tablets and sleep on a Chillow. I don’t believe Sweaty is dead but I’m happy that he’s at least gone on holiday for a while! Hi Alison I had sweaty for about 3 months and very little sleep, therefore grumpy and bitchy were in the forefront. I’ve bought Sainsburys own menopause tablets they are in a lilac and white box and are three for two at present. I have had about two swears in the last 6 weeks, am sleeping much better and grumpy has practically disappeared. Like you I am a fitness freak and I cannot get rid of my muffin absolutely hate it have cut down on my carb intake also. I love this post and I too had some of these unhelpful visitors a few years ago. Thankfully they have moved out and won’t be invited back. I kept them at bay with lots of exercise, a good Omega 3 supplement and high dose vitamin B complex. I hope your unwelcome guests move out soon! Hello there! Found you via Tracy McAlpine (Fighting Fifty) on Twitter. The Menopot description is a hoot! I find I can keep it down to about half a gateau if I’m good about avoiding certain food (ish) groups that I once used to snicker about being other people’s problem. What goes around came back around I guess. As for the rest of the Dwarves, I can’t say they’ve been making themselves comfortable hereabouts. Might have something to do with that transparent patch I have on the Menopot, See, it DOES have a use!